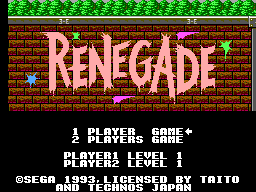 Renegade was an old game by the time it reached the Master System in 1993, as the arcade came out in 1986. So was it worth the long wait and worth finding today? 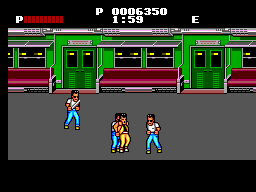 It's a beat-em-up in the style of Streets of Rage and Double Dragon, where you must beat up and knock out all the thugs by punching and kicking them down or by doing flying kicks and forcing them off the edge of the platform. When you first start playing the game, the frustration level can get very high when trying to get the better of the thugs, as pulling off moves can be very hard until you gain the knack of it. The game is a two player game but not at the same time. To me this is a complete waste as even Double Dragon attempts a two player mode. There is some variety in the levels in hope to keep you interested. The graphics are drawn well with good backdrops and good use of colour. There is little or no flicker but they do look a bit dated. Each level has a nice tune which sets the mood for the game really well. However, sound effects are only average with bleeps and boops. The controls can be frustrating as it can be tricky to get your fighter to face the right way to hit the thug. This can be so hard but once learned you won't have a problem with it. If you don't master the controls you will bin the game as you won't enjoy it. If you give it a chance though, you will return to try and beat the game. Some games have it and some don't. For me this game is only average. 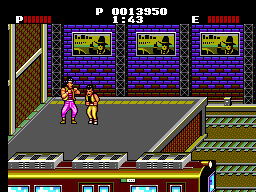 Double Dragon and Streets of Rage are much better all-round games to play, offering fun and easy controls. Renegade isn't a bad game however, it's just others do it better.